A learning culture is crucial to the wellbeing of any organization that wants to excel and go beyond both expectations and competition. Far more than ensuring staff stay current and compliant with basic performance standards and training, the learning and development that such a culture calls for is farther reaching and more complex. While the issue must fundamentally align to business strategy, this is not achieved by all businesses; failure to co-opt learning and development into the organizational vision can be down to any number of reasons, such as a lack of resources, interest or understanding of the purpose of L&D from business leaders. Real learning and development is less about teaching, and more about creating an environment that facilitates self-learning. Individuals can process information into knowledge, values and skills at their own pace while guided by the company. In this respect, learning becomes an active, participative and far more rewarding process. The best L&D comes off being proactive instead of reactive. Eades argues that new ideas and thought leadership should be encouraged within the organization, and proposes “finding the bright spots”, a concept taken from Chip and Dan Heath’s book, Switch. As such, individuals are given the chance to solve major organizational problems and to take ownership of greater responsibility. The best learning and development process is dynamic, able to “identify and execute” on a learning opportunity in a timely manner. This is vital if L&D is to be a core driving force within an organization. Being valued is crucial to employee satisfaction. The opportunity to learn and develop produces achievement and responsibility. If rewarded and recognized with promotional opportunities, then elements of Herzberg’s Two Factor Theory of Motivation start to fall into place. These are key elements to work place ‘satisfiers’ which make for a happier, more dedicated workforce. A more content workforce will reduce chances of employees leaving the company. Similarly, if properly motivated, staff will want to fulfil their potential within the firm, improving competencies, target-meeting and enhancing the value of the organization. When departments do not co-operate with data sharing within the same company, the firm’s overall efficiency will drop and this may eventually impact on morale as employees experience an erosion of productivity. This failure to share between sectors is known as the silo mentality; a problem for organizations of all sizes, and a headache for executives who need to break the destructive mind-set it perpetuates. The maxim, ‘knowledge is power’ is perfectly applicable when combating the silo mentality. Learning and development initiates knowledge and collaboration within teams that need to rely on one another to problem solve. Learning also nurtures understanding and appreciation of other perspectives, which is a powerful antidote to the silo mentality in itself. To complement the L&D dynamic, management teams are encouraged to create smaller meeting rooms, reduce the number of long meetings and create an education/training system that crosses departments. Sheffield Business School researcher, Dr Louise Suckely says that courses “not only inject fresh skills into a business, but also help to generate new ideas and revenue streams while inspiring staff to achieve more.” To help measure ROI, Suckely refers to “The five levels of impact for the ROI model”, which considers engagement, learning, application and implementation, and business impact to calculate ROI. Brian Keady says that different firms will find it easier to work out returns from learning and development, and proposes involving the right stakeholders as the basis to making sense of your organization’s ROI. Integral to a firm’s success at all levels, learning and development is crucial if companies are to compete in their marketplace, as the demise of UK firms such of HMV and Kodak have demonstrated. The fall of IMB’ SNA technology serves as a similarly stark warning of what can happen to the strongest of corporates when they fail to realize the importance of keeping speed with industry-wide learning and development. Learning and development must “comprehend, role model and embed the culture and performance framework of the organization by providing intervention that enable the business to increase its KPI performance and achieve its strategy”. 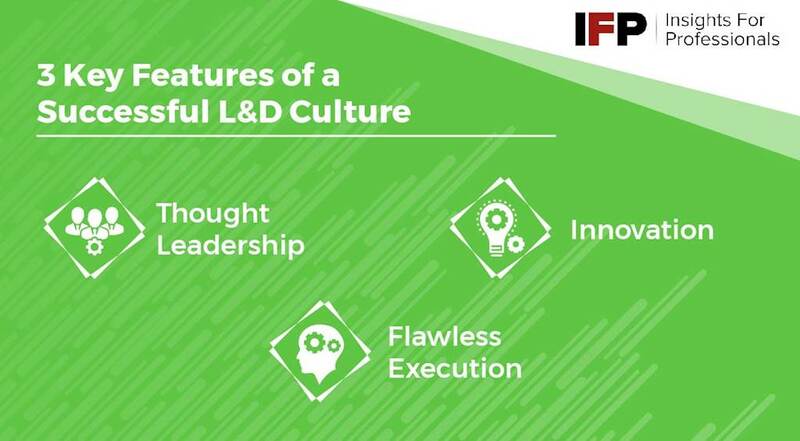 Within this fundamental role of L&D, organizations are challenged to meet organizational and learner requirements while staying competitive in fast-paced environments. As such, teams concerned have to work collaboratively, making sure that L&D remains agile and timely. This dynamic element must be blended with technological developments and emerging insight, with one eye always on the future for professional competencies to manifest themselves in a way that sustains company growth and drives organizational success.